Turned your computer off? Good. Now get out and play. Let’s face it. Life in the city can only take you so far, and that’s not very far. When it comes to experiences on a grand scale, you need to leave it all behind. You also need a car to take you to wherever that place might be. The Volvo V60 Cross Country with AWD will take you to roads with the most demanding conditions. 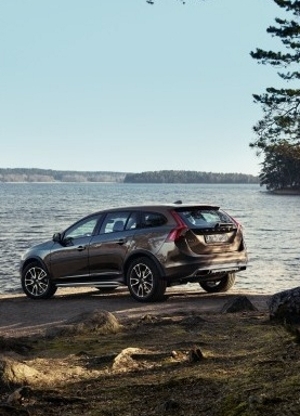 And to have the least possible impact on nature, our V60 Cross Country with Drive-E engines combine high performance with low fuel consumption and reduced emissions. So, get out there and play. There’s really no excuse not to, is there? 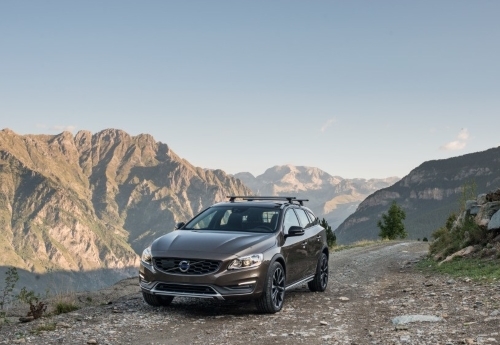 To complete the outdoor family, the V60 Cross Country is joined by the new Volvo S60 Cross Country. The S60 Cross Country has an increased ride height of 65 mm and comes with capable All Wheel Drive underpinnings, making it the only truly capable and stylish all-road sedan crossover on the market. The S60 Cross Country will also be delivered with front-wheel drive in Europe and selected markets. Delivering an involved and focused driving experience with rugged substance, this dynamic design brings a sporty, unconventional and adventurous edge to the sedan concept. The exterior features a unique cross country honey comb grille, glossy black green house, glossy black mirror caps and a Cross Country emblem embossed in the rear skid plate. Reflecting Volvo’s love of nature and Scandinavian heritage, the S60 Cross Country offers both 18” and 19” wheels with high profile tyres that add both comfort and all-road aesthetics, reduce road noise, and add increased wheel protection when needed. The S60 Cross Country is available in five exterior colours: Onyx Black, Osmium Grey, Crystal White, Bright Silver and Rich Java. Scandinavian design is exemplified by beautiful, simple shapes and surfaces with any unnecessary clutter removed. This is evident in the interior and exterior. Inside, the attention to detail, the authentic materials – such as wood and leather – and the easy-to-use controls contribute to the in-command driving experience. The interior detailing includes a Piano Black deco option, rotary jewel-like knobs in the centre stack and a frameless inner rear-view mirror. The S60 Cross Country features a sport seat that make a perfect addition to the in-command feel of a true driver’s car. It has great hugging side support all the way from the thighs to the shoulders, so the seat keeps the driver firmly in position when cornering at speed. The S60 Cross Country will launch with a powertrain programme, ranging from a powerful T5 All-Wheel Drive petrol powertrain delivering 254 hp to the front-wheel drive 190 hp diesel D4, based on Volvo’s class-leading Drive-E powertrain architecture, offering a no-compromise blend of efficiency and performance. Fuel consumption in the S60 Cross Country D4 with manual gearbox is 4.2 l/100 km (111 g/km). An All Wheel Drive D4 based on the proven 2.4-litre, five-cylinder diesel engine with 190 hp is also available. The driver display uses an active TFT (Thin Film Transistor) crystal display to bring the driver personalised information. There are several alternatives to choose from, including a unique brown cross country theme. The Digital Display theme colours are also echoed in the connected infotainment system Sensus Connect. It features a refreshed user interface with a number of innovative functions offering customers a fully connected experience. The Bluetooth mobile phone service allows hands-free phone conversations as well as music streaming from a preferred Bluetooth enabled portable music player. The Sensus family also includes a top-of-the-line Premium Sound system with a 5x130W amplifier with the next-generation sound enhancement software Dirac Live and up to 12 loudspeakers, including a long-throw woofer for enhanced bass, soft dome tweeters for soft highs and large mid-range centre and door speakers. With the Premium Sound system by Harman Kardon the driver can enjoy an immersive sound stage with improved bass performance, while being able to turn up the volume with full audio clarity. IntelliSafe, Volvo’s blanket name for all active safety systems, is an important part of the driver-centric approach in the S60 Cross Country. The Electrical Power Assist Steering (EPAS), available with the Drive-E engines, uses an electrical motor to support the steering rack, and the driver can choose between three levels of power assistance. In Low mode the system provides a high degree of power support, making manoeuvring easier. Medium mode has somewhat lower power support to offer more road response at higher speeds. High mode is the ultimate setting for the enthusiastic driver, contributing to the car’s dynamic character. Hill Descent Control, which automatically keeps the car at a constant speed when driving down a hill, is standard on All Wheel Drive versions. The Active High Beam Control eliminates the need to switch between low and high beam. Instead, Active High Beam Control makes it possible keep the headlights on high beam continuously. When another car approaches from the opposite direction, the system helps to prevent dazzling of the oncoming driver by shading out only as much of the beam as necessary. This is done by an ingenious projector module mechanism integrated into the headlamp. The same benefit applies to drivers in preceding cars. New advanced software, including more rapid vision processing made it possible to extend Volvo Cars’ detection and auto brake technology to cover certain cyclist situations as well. The Pedestrian and Cyclist Detection with full auto brake is equipped with an advanced sensor system that scans the area ahead. If a cyclist heading in the same direction as the car suddenly swerves out in front of the car as it approaches from behind and collision is imminent, there is an instant warning and full braking power is applied. The technology also detects if a pedestrian steps out into the road in front of the car. If the driver does not respond in time, the car can warn and automatically activate the brakes. The S60 Cross Country features a City Safety system that is active at speeds up to 50 km/h. The car automatically brakes if the driver fails to react in time when the vehicle in front slows down or stops – or if the car is approaching a stationary vehicle too fast. 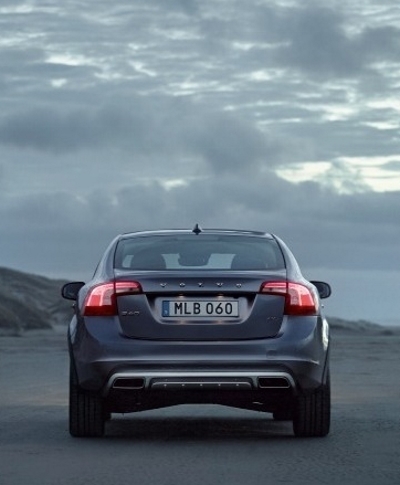 The S60 Cross Country offers the radar-based Blind Sport Information System (BLIS. The technology can monitor and alert the driver to rapidly approaching vehicles up to 70 m behind the car. Of course it still informs the driver about vehicles in the blind spots on both sides.